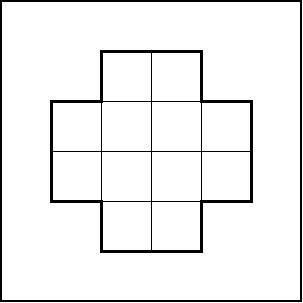 Write the numbers 1 through 12 in the squares below so that the two columns, the two rows, and the five squares that can be formed with four numbers in each have a total sum of 26. Can you find the solution where no two consecutive numbers are next to each other horizontally, vertically, or diagonally? Follow the numbers starting from 1 to 12, do you notice the pattern? ^ You may be a maths genius, but for that you used computer software.